Can form player Clive win again? There cannot be a finer setting for this summer fixture than the Blue and Red courses that wind their way through heathland and woods in some of the most stunning Berkshire countryside. You will not find a better test of golf anywhere and, as most of you will know, the Club is also famous for its mouth-watering food so prepare your waistlines for that traditional carvery lunch with all those wonderful old fashioned puddings! We’ve moved this fixture to July to take advantage of what should be lovely weather and with the daylight enabling everyone to finish their afternoon round in good time. Included in the cost of the day are both rounds of golf, the Blue in the morning for the singles and then in the afternoon out on the Red for the drawn greensomes. There is coffee on arrival with bacon roll, the carvery lunch and sandwiches, PLUS, £5 for entry into the 2’s and the Ball Sweep. A full English breakfast to start the day can also be ordered on arrival but this will need to be paid separately. There is also the fund raising “Back the Winner” contest at £5 a time, have as many goes as you like. Out last winner, Clive Heard, backed himself at the Walton Heath fixture and being the only person who selected him to win, took home a handsome £100 in winnings with £60 to the Society funds. 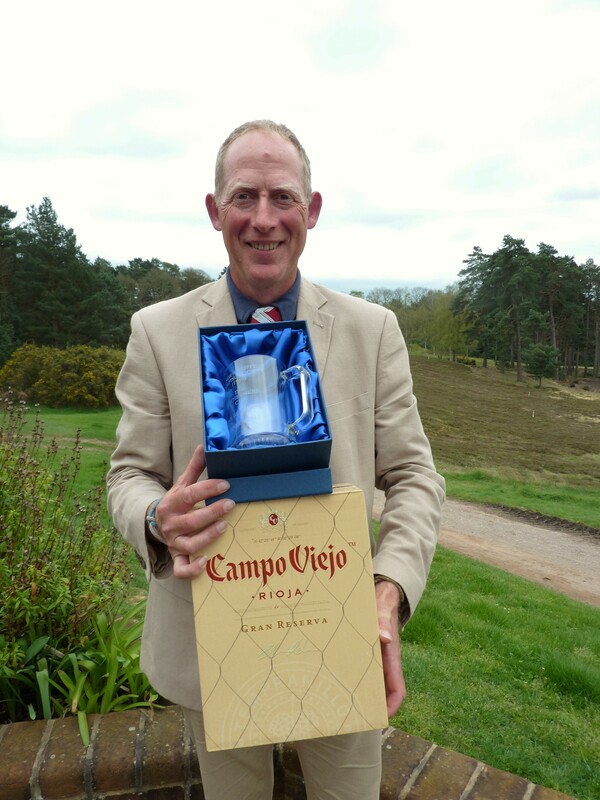 Having also won last year at the Berkshire fixture in April, playing off 8 handicap and with his Club since then further cutting him to 6, the Society’s form golfer will now be playing off 5 handicap after winning at Walton Heath. Will he be able to feature again in the prize-money? Enter by submitting your details to the secretary for The Berkshire golf day. Please send your name and contact details via the Contact Us page or email them to mailto:gpburden@ntlworld.com. Payments of £79 can be made direct to the society’s account. • The Clubhouse opens at 7 a.m for Bacon or Sausage roll, tea or coffee followed by Carvery lunch with prize giving early evening. • Blue Course Morning: 18 Holes Stableford singles competition off full handicap. Yellow tees. • There will be an 8.30 a.m start from the 1st and 7th tee. • Red Course Afternoon: 18 Holes Greensomes stableford. Half combined handicaps. Champagne will be awarded for “Nearest the Pin” in the morning on the 1st and the 18th in afternoon. • A list of playing partners and tee-times will be circulated before the day. and is taking time to assess their options. from the hole but is delayed due to raking the bunker. other player is walking to their ball and assessing their shot. to tee off marks their card immediately after teeing off.